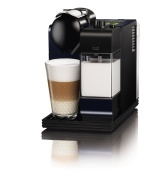 alaTest has collected and analyzed 2216 reviews of Delonghi Lattissima+ EN 520. The average rating for this product is 4.6/5, compared to an average rating of 4.4/5 for other products in the same category for all reviews. Opinions about the design and price are generally positive. The maintenance and performance are also appreciated, but there are some mixed opinions about the noise. We analyzed user and expert ratings, product age and more factors. Compared to other products in the same category the Delonghi Lattissima+ EN 520 is awarded an overall alaScore™ of 87/100 = Very good quality. It may not come cheap, but the Nespresso Lattissima EN520 is the perfect match for someone who likes to drink a latte rather than sticking to pure espresso and Americano drinks. It's compact, it's simple and it makes great coffee.